Another good food and beer pairing tonight. Sometimes, after a big lunch at work, I only want a small meal in the evening. I find a nice crisp salad with a good dressing can really hit the spot (and carries almost no calorific value at all). 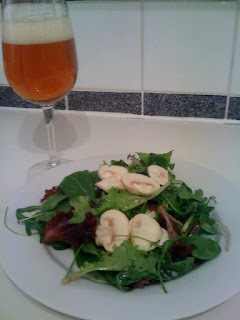 I've never tried pairing a beer with salad before, but had a bottle of Shepherd Neame Whitstable Bay in the cupboard and it looked like they could work well together. They did. Something I really like, is raw mushroom. If you've never tried it, then I highly recommend it. The taste and texture is totally different to a cooked mushroom. When cooked, it's easy to over do it and end up with a slimy, watery, tasteless result. When raw, the texture is totally unique and the flavour is magnified ten fold. Any mushroom will do, just make sure they're very fresh. Give them a rub over with dry kitchen paper, to remove any dirt, then slice them into pound-coin-thick chunks. The rest of the salad is mixed lettuces, rocket and some baby spinach leaves. For the dressing, combine 2-3 parts olive olive, 1 part rice wine vinegar (or any light vinegar,) 3 parts of the beer and enough salt to season. Combine well and pour over the salad. You want enough to give each leaf a thin coat but not so much that you swamp everything. It's also important to remember that the dressing should go on right before serving, any sooner and the leaves will wilt under the acid. The pairing works for a number of reasons. The flavour in the salad is delicate, but so is the beer. If either were any stronger, the balance would be tipped. The maltiness in the beer compliments the earthy flavour of the mushroom, the beer's bitterness sits aside the the metallic iron flavour of the spinach and the citrus notes from the hops work with the acid in the dressing. If I were to criticise anything, it would be that the citrus notes in the beer are probably a tiny bit lacking. If they were more in your face, I think this would work even better. Salad can often be a bit dull. There really is no need for it to be though, a little bit of effort can turn it into something great.